There's something about living in a treehouse that beckons to the child within us; the illusion of an otherworldly existence complete with fairy doors and pixie dust. It's not just about being suspended above the ground, but more the idea of being in a womb-like cocoon sequestered from the world below. Throw in room service, an ayurvedic spa, buffet meals and a stocked bar and you are have found yourself the perfect haven. 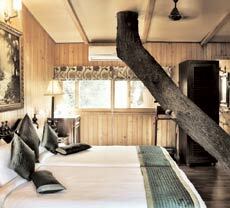 The Tree House Resort, just an hour from Jaipur, is all of this and more. A leisurely four-hour drive from New Delhi, just to the left of the fork-road towards Jaipur, a marked gate opens into Nature Farms, the 300-acre property on which the resort has been raised. There are a total of eight 'nests', sized from cozy doubles to spacious suites, each named after a bird and decorated in keeping with the name. I was booked at one of the more modest rooms, the Pied Harrier's Nest. The room came equipped with all the usual amenities: satelite tv, airconditioning, room service, a mini fridge (no mini bar within) and ensuite bathrooms. But what distinguishes it from just any room are the partial sunroofs in the room and bathroom, and of course, the view from the windows to remind you that you're above the canopy, not under it. Having reached late the previous evening, I was up bright and early, to reflect at daybreak and, I must admit, catch the breakfast which is served buffet style from eight to ten every morning. The walk from my nest to the dining room took me through some of the other nests along a winding path shaded by dense bushes and trees. The spread for breakfast was a pleasant surprise. Aside from the Indian option of upma and paratha, there were eggs to order, well seasoned baked beans with hot toast, cold cuts, fruit, cereal, and pancakes with maple syrup accompanied by tea, coffee or freshly squeezed juice. Happy after the good meal, I decided to walk off the inertia before heading for my spa appointment. A stroll around the premises was spent exploring and discovering every bend and crevice. They have a gift shop with the usual bric-a-brac and some paintings done by local artists, though shopping doesn't feel very natural given the environment (my bag was stashed away in a corner of my room until checkout). Walk taken, I went in search of the pool, hoping for a leisurely dip after my massage but was disappointed when I saw it. Unlike the pictures on the website which give it the appearance of being a decent size, the pool is actually miniature and didn't seem much deeper than a wading pond. It had been a couple of hours since breakfast, and finally i felt sufficiently exercised, so it was time for a massage. Housed in a grounded cottage, the two-room spa offers a rather extensive list of procedures for a boutique resort of its kind - body scrub, hot stone massage et al. Having opted for more adventurous options in the past, this time I decided it would be best to play it safe. I opted for the signature taruveda massage, a 75-minute ritual which the spa manager assured me would be well worth my while. The private massage parlours are well appointed with attached showers, comfortable massage beds, ambient music, perfectly adjusted room temperature, and a still atmosphere. The next 75 minutes were close to blissful. Though my masseuse was not the best, she dispelled all the knots in my back and managed to lull me into a state of half sleep. Almost an hour and a half later I floated out of the cottage, feeling a lot lighter than before. My morning at the spa was well spent. Lunch came on at two, back in the dining room. With a generous spread of eight to ten dishes, the meal is complete value for money. The lal maas came loaded with flavourful, marinated red chillies and was absolutely delicious, as were most of the other dishes on the menu that we tried. Well relaxed and well fed, noon called for some serious siesta time and I happily obliged. A couple of hours later, once the sun had dulled, I headed to the tennis courts to pack in some activity to my otherwise restful day. Aside from tennis, there are several other recreational activities to choose from. There is a putting green and you could also play billiards, use the gymnasium or bond with nature by taking an elephant or camel rides, opting for a jungle safari or bird watching with a guide. Additionally, the property houses a conference room, making the retreat an ideal off site for executives. Once the sun set, the evening was magical. Winter months make for a lovely evening around a camp fire in one of the open lawns. April was too hot for that, so I settled for a drink at the Peacock Bar instead. Shielded by tall ferns on all sides, the bar is hidden from view until you make your way through the marked pathway all the way up to it. This is probably one of the nicest spots at the resort. 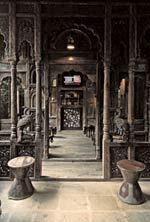 The 400-year-old, intricately carved wooden structure has been tranported from a haveli in Rajasthan, and anchored into its current position by the owner. Although parts of the display have been restored, it is still largely unaltered. Standing testimony to the weathered years, it welcomes patrons to understand its history while the bartender douses you with generous helpings of alcohol. Try a glass of their red Zampa wine, from the vineyards on the periphery of Nasik. I enjoyed more than a glass or two over conversation with the manager who lives just off the premises and is an embodiment of the hospitality and warmth the property exudes. Drinks gradually progressed to dinner, which is served buffet-style at the lawns and can be enjoyed in one of the open gazebos scattered close by. My visit happened to coincide with the IPL season, and so naturally, cricket fever was in the air. The match was being screened outdoors and was perfect for those of you who like to pack in some telly time over dinner. A weekend at The Tree House Resort does the job; it's not too far out of Delhi and allows you the pleasure of being close to nature without driving for hours. Head here for a simple vacation that spells pleasure.